Best buy is your trusted in-store And online carrier for your favourite brand name electronics. Best Buy offers nearly every brand of television, MP3 player, digital camera and tablet, covering nearly everyone on your list with their competitive prices and helpful sales associates. With a convenient online and layaway service, Best Buy can help you get the best gifts- at the best prices. We have exclusive access to the FULL Best Buy Canada Boxing Day flyer 2018. The Boxing Day sale starts on December 26, 2018, and valid until January 3, 2019. Tons of amazing and sizzling hot deals in this Best Buy Boxing Day Flyer deals 2018. 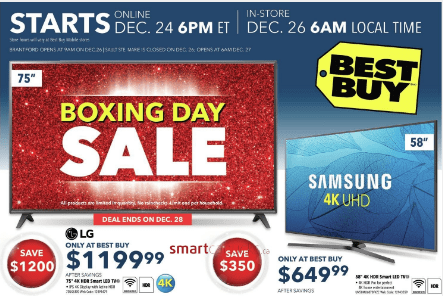 Click here to view the fill Best Buy Canada Boxing Day flyer 2018. We have exclusive access to the FULL Best Buy Canada Boxing Day flyer 2018. Tons of amazing and sizzling hot deals in this Best Buy Boxing Day Flyer deals 2018. Click here to view the fill Best Buy Canada Boxing Day flyer 2017. Best Buy Canada Boxing Week still live with great deals! 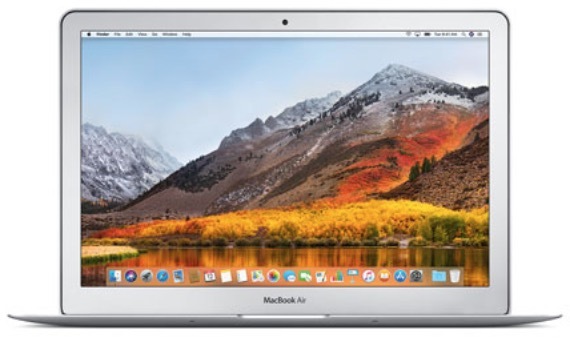 Get Apple MacBook Air 13.3" (Intel Core i5 1.8 GHz/ 128GB SSD/ 8GB RAM) for $1.049.99, save $150 off, with FREE shipping. Click here to view all Boxing Week offers. Shop the Top 30 Online Deals at Best Buy Canada! Best Buy Canada offers FREE shipping on most orders of $35 or more. Click here to start shopping at Best Buy Canada. Click here to view Best Buy’s latest flyers.